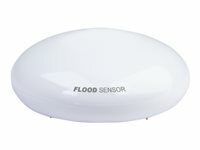 This Schwaiger water sensor is a universal sensor which does not only detect water but also the temperature of the surrounding area. The sensor can be put on the floor. An RGB LED indicates communication with the gateway.